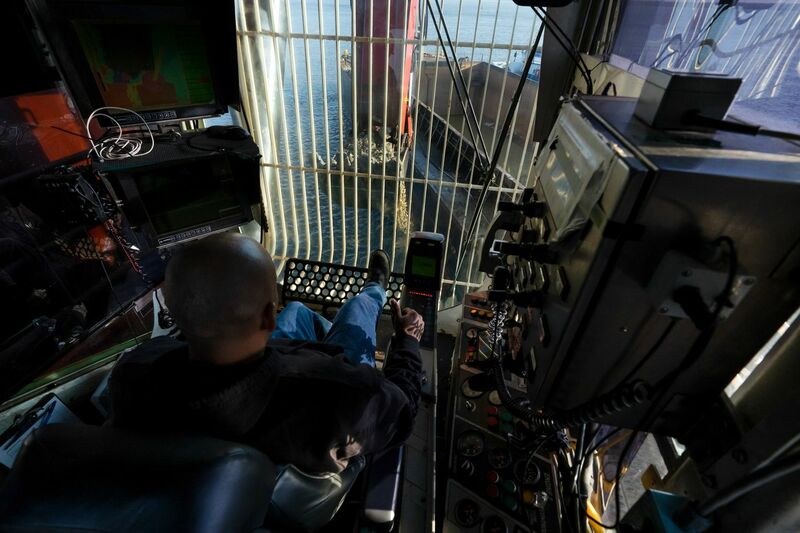 Steve Castillo reclined in a vinyl seat in the cramped cockpit of the New York, a 3,400-horsepower monster dredge, manipulating controls that extended the vessel’s mighty excavator arm deep into the dark waters of the Delaware River. He glanced at a monitor depicting the scene 45 feet below the surface, where the excavator’s giant bucket gouged bedrock on a recent morning, deepening the river channel to accommodate a modern fleet of larger cargo ships. Castillo, who is from West Palm Beach, Fla., was fortified with a case of bottled water, a cooler full of snacks, and a radio that he joked seemed only to receive stations playing holiday music. He was settled in for the long haul. The same could be said for the Delaware River deepening project, which officials say will finally be finished next year — nearly three decades after it was first approved, and two years behind schedule. The dredge New York is designed to excavate the hardest material from the river bottom. "We’ve been waiting a long time for this, but we’re excited,” said Sean E. Mahoney, director of marketing for the Port of Philadelphia, the state agency that is paying for 35 percent of the dredging costs — about $140 million of the total tab of $400 million, which has increased from its initial budget of $300 million. Mahoney hopes that by the end of March, PhilaPort can notify international shipping companies that the deeper river channel is open for traffic. The U.S. Army Corps of Engineers, the agency overseeing the dredging, estimated it will generate net annualized benefits of more than $40 million to the U.S. economy. Local officials say the deeper channel will keep PhilaPort from being marginalized in the competition for the new vessel traffic. Since Congress approved a plan in 1992 to deepen the Delaware’s main channel from 40 feet to 45 feet, the project has survived litigation from environmentalists, who alleged it would harm marine life, and from neighboring states, which saw no benefit in improving the shipping industry’s access to Philadelphia’s port. After dredging finally began in 2010, federal funding was not always reliable, further slowing progress and driving up costs. Earlier this year, the project was literally stuck between a rock and a hard place. The Army corps said that rock outcroppings concentrated in a 10-mile stretch of the river between Eddystone and Wilmington were larger and more durable than anticipated. It needed to call in reinforcements. The corps' contractor was able to dislodge much of the rock with explosives, but blasting is limited to four winter months to reduce harm to migrating sturgeon. And several areas could not be blasted because they were too near to buried gas and fuel pipelines and a submarine Comcast fiber-optic cable — there are about 30 separate utility crossings under the Delaware. So the corps imported an eight-ton underwater hammer from Europe to break up the hardest bedrock near the pipeline crossings. It also extended its contract with Great Lakes Dredge & Dock Co. LLC to bring back New York, the monster dredge whose specialty is clawing out the hardest material. Last month the corps approved the final payment of $29.2 million to finish the deepening project. The deepened 103-mile channel will enable the Port of Philadelphia to handle ships that can carry up to 14,000 20-foot shipping containers, or 14,000 TEU, in tradespeak. The largest ship handled by the port at the current 40-foot depth was 12,200 TEU, which arrived earlier this year. The deepened channel will allow those ships to come fully loaded to Philadelphia, rather than having to stop first at another port to lighten their cargo. Several East Coast ports — Boston; Charleston, S.C., Savannah, Ga., and Jacksonville and Port Everglades, Fla. — have also deepened their channels to accommodate larger ships that can pass through the Panama Canal since it was enlarged in 2016. While the Philadelphia project dragged out, New York and Baltimore deepened their channels to 50 feet. Congress has authorized Norfolk to go up to 55 feet, the deepest on the East Coast. “As evidenced by the fact that every other major port on the East coast currently enjoys channel depths of 42 to 50 feet, deepening the Delaware River navigation channel to 45 feet is critical to regional commerce and an important economic development priority,” the Maritime Exchange for the Delaware River and Bay said in a 2016 pitch for continued support for the deepening project. The deepened channel comes as PhilaPort faces tougher competition just 35 miles downriver from the Port of Wilmington, which this year agreed to lease its facilities for 50 years to a Gultainer, a United Arab Emirates operator that has promised to invest $600 million to upgrade the port’s container capacity from 350,000 TEU to 1.8 million. PhilaPort, with state backing, is investing $300 million to upgrade the city’s primary container wharf, the Packer Avenue Marine Terminal, with taller cranes and bigger berths to handle larger vessels. Although Delaware and New Jersey are not paying for the deepening project — those states sued to block it — their terminals on the Delaware River will also benefit from access to larger vessels. A dockside gantry crane at the Packer Avenue Marine Terminal lifts a container in February onto the MSC Shuba B, the largest to ever call at the port. PhilaPort says that with a deepened channel, even larger ships will bring more cargo through the city. Larger container vessels, especially those loaded with refrigerated fresh produce from South America for which Philadelphia has developed a market, can now carry bigger loads to Philadelphia without having to lighten their cargo. Crude-oil tankers, which typically must unload part of their cargo into smaller “lightering” vessels in the Delaware Bay so they can move up the 40-foot deep channel to the area’s refineries, will now move more efficiently in a 45-foot deep channel. Steve Castillo stands in the doorway of cockpit of the dredge New York, where he operates the excavator. The Army Corps needed to demonstrate a national economic benefit to deepening the Delaware River channel, not just a benefit to the Philadelphia port that might come at the expense of another region. The corps' calculus was much disputed, and some critics still say the numbers were engineered to produce a net national benefit. The corps maintains that neither the dredging nor the disposal of 16 million cubic yards of sand, muck and rock has caused environmental harm. The finer dredge spoils are dumped in federal facilities, such as the Fort Mifflin Disposal Area located beneath I-95 on the southern approach to the Girard Point Bridge. The heavier rocks are deposited into state disposal areas in Delaware Bay to create an artificial reefs. Environmentalists are skeptical. They say there has been little testing of the effects of dredging, and that the environmental harms are likely to be long-term impacts on tidal flows and wildlife that will not be immediately detected. “The bottom line is that we know the harms will come, it is not a matter of if, it is a matter of when and how bad (just like climate change),” said Maya K. van Rossum, head of the Delaware Riverkeeper Network, which fought a long and ultimately unsuccessful legal battle to block the project. “And we also know, from the ports themselves, that the deepening was not necessary, there were other options, and that in the end the taxpayer footed the bill to pit one port against the other, not to secure a net gain for the nation," she said. The project’s advocates say the Riverkeeper’s arguments are water under the bridge, and they’re now focused on finishing the job. Dredging is laborious, methodical work, and not all earthen materials are alike. Some mud and gravel can be literally sucked out of the river in great volumes with giant hydraulic dredges, and the spoils are then pumped into lagoons where the water drains off, leaving behind essentially soil that is "beneficially reused” as fill material. Much of the land beneath the runways of Philadelphia International Airport formerly resided at the bottom of the river. But hard rock requires more time and money to extract. Such is the case in the area of the river called Reach B, where the dredge New York was working recently on the outbound side of the river, a few miles below the Pennsylvania state line. The original rock-removal contract won by Great Lakes Dredge & Dock was $90.8 million, based on a excavation price of $217 a cubic yard. Other contracts in less demanding sections of the river — 10 contracts were split up among four dredging companies — were priced as low as $4 a cubic yard. “This is some of the hardest rock I’ve ever dealt with,” said Cecil Constanzi, chief engineer of the New York, who has worked on the vessel for 17 years. Cecil Constanzi, chief engineer on the New York, which is owned by the Great Lakes Dredge & Dock Co. “This is some of the hardest rock I’ve ever dealt with,” he said of the Delaware River dredging project. Some of the rock was dislodged with explosives, which are packed into holes drilled into river bottom and detonated. But the areas where the river flows over submarine pipelines proved more challenging, particularly just below the Commodore Barry Bridge in Chester, where a 20-inch diameter natural gas pipeline crosses less than six feet below the deepened river channel’s new bottom. No explosives were allowed, said Kenneth Goldberg, chief of the corps’ technical support branch in Philadelphia. Rather than blasting, a scheme was devised in which rock was drilled with a series of holes, reducing it to what the engineers called “Swiss cheese.” The dredge then broke up the perforated rock using a hydraulic hammer that was brought in from Holland and attached to the excavator arm. “That worked, until it fell off,” said Goldberg. Retrieved from the river bottom, the hammer now rests on a dock at the corps' Fort Mifflin facility, awaiting repairs, and a more durable harness. Richard Millis, captain of the New York, looks out of the bridge toward the excavator, whose giant claw is breaking up and removing rock from the Delaware River. The dredge New York, meanwhile, continues to chug away, 24 hours a day. There is nothing sleek about the vessel — it’s an industrial workhorse, purely utilitarian. The dredge plants itself in the river on jack-up legs that lift the hull for stability. Its bucket can remove 12.8 cubic yards of rock with each pass, enough to fill a dump truck. The dredge is under contract in March in Jacksonville, Fla., so its Delaware River engagement is limited. The dredge costs the corps $200,000 a day, Goldberg said, so the government agency is sensitive about more delays. This is the fifth time the Delaware River channel has been deepened since 1898, when it was dredged from its natural depth of 17 to 24 feet to a depth of 26 feet. (It has been 40 feet deep since 1942.) The high cost of removing bedrock raises a question about whether it would ever be economically feasible for the corps to go deeper than 45 feet, since it will encounter much more rock, and some pipelines might need to be relocated. The Delaware Memorial Bridge in Wilmington, with an air clearance of 174 feet, might also be a barrier to a new generation of big ships. By comparison, the corps project to deepen the Port of New York and New Jersey to 50 feet cost $2.1 billion, more than five times as much as Philadelphia. That did not include an additional $1.7 billion to raise the level of the Bayonne Bridge, from 151 feet to 215 feet, to allow larger vessels access to the port. The consolidated New York area ports handled more than three million containers in 2016, six times the volume of PhilaPort. Philadelphia officials say they aren’t even thinking about going deeper, for now. “We think the 45-foot channel will suit us perfectly fine for decades to come," said Mahoney. A timeline of the Delaware River dredging projects since 1898. The Port of Philadelphia, then known as the Philadelphia Regional Port Authority, became project sponsor in 2008 after the Delaware River Port Authority, a multi-state agency, bowed out.